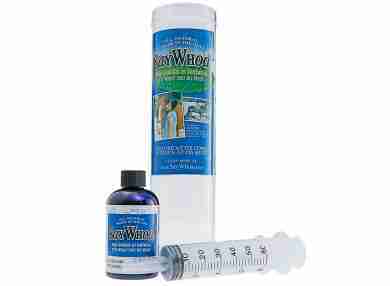 Promotes normal digestive “Flow" to assist with Bowel Movements. SayWhoa! is a Revolutionary Product. Horses may become dehydrated and impacted by simple acts of severe weather changes, an abrupt change of feed or long horseback rides. SayWhoa! promotes the normal flow of digestion. It's What You Do First! Packaged one dose per horse. You would give the full bottle. it may be as simple as your horse refusing feed. This is a common sense approach to keeping digestive tract moving. This unique formula promotes normal digestive “Flow" to assist with Bowel Movements. For use in Horses Only. May be given to horses any age, size or weight. Mares lactating or in foal. PROMOTES NORMAL BOWEL MOVEMENTS. Packaged one dose per horse. You would give the full bottle. For horses 100 - 1200 lbs: Full 4 oz bottle (120 ml) Packaged one dose per horse. You would give the full bottle.